Sun Valley Summer Symphony audiences and musicians are enjoying super-tuned sound at the Sun Valley Pavilion this summer. 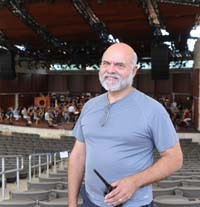 Sun Valley Summer Symphony Production and Stage Manager Jim Quinn and his team of audio techs worked hard all winter to tweak the concert hall's acoustics in order to take full advantage of the multi-million-dollar, sit-in facility. "The quality of the sound has improved, and the power," Quinn said in an interview. "The entire orchestra can hear itself better. This is very important." Some of the modifications Quinn and his team have made include the addition of sound-absorptive material above the musicians, installation of a new stage floor and reconfiguration of the riser set-up for the percussionists. "The pavilion has too many pathways of reflected sound," Quinn said. "We put some absorptive panels right above the orchestra to help address this issue. The audience can't see them, but they significantly cut down the unwanted reflections. "We also installed a new stage floor this year. The new floor has a major effect on the strings, especially for the cellos and basses," Quinn said. "The experiments with the floor material began three seasons ago with a performance of Beethoven's Ninth Symphony. We installed a cheaper version of the current floor to bring out the cellos and basses. It worked. This year we pulled the trigger and installed a much more expensive version." The floor is a made of a "specially engineered substrate" with a thin, natural hardwood surface. "We also changed the riser curve for the percussionists," Quinn said. "Now, they are pointing toward the center of the hall, in a calculated curve, instead of straight out toward the audience. The percussionists are a little higher off the floor, too, almost like a mirror version of the audience. This allows the sound to spread out better and have more impact." Looking forward, next season's improvements will include a "special," acoustically reflective wall that can be installed or removed easily to reduce the size of the entire hall, making the pavilion more "appropriate" for lower-volume chamber music. The flip side of this wall will be acoustically absorptive, making it an "ideal" tool for increasing the intelligibility of amplified speech for such events as the Sun Valley Writers' Conference.